Contemporary, retractable, stainless steel barrel 0.7mm ballpoint pen with a non-slip grip that is both stylish and durable. Black ink. 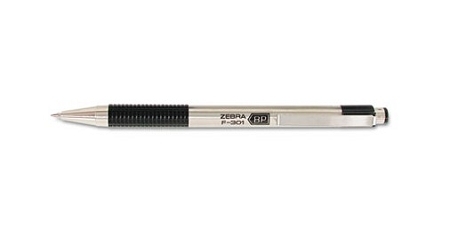 Lightweight yet durable stainless steel barrel provides a modern, attractive appearance. No-slip, checkered grip fits into your hand perfectly. Produces clean, smooth writing.